Reinforce One-To-One Correspondence With This Preschool Printable! One of the first skills a preschool piano player must develop is an understanding of one-to-one correspondence. This term refers to a child’s ability to match one object or image to a corresponding number, symbol or… action. When it comes to piano, the required “action” involves the ability to press a key and make a sound for a number of notated symbols ( ie. one symbol, one sound or two symbols to two sounds etc.). Being able to match sounds to symbols lays the groundwork for all note reading and rhythmic understanding that follows. For preschoolers, an understanding of the idea that symbols on a music page represent a quantity of sounds is a concept that requires a lot of reinforcement and creative teaching. But… the extra effort is worth it! Not only will your minis develop the ability to understand early notation, but they’ll have a head-start on kindergarten readiness! 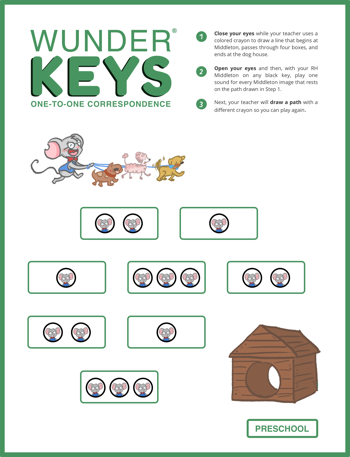 Today’s printable is a very cute way to reinforce one-to-one correspondence as your students help Middleton Mouse return the dogs to the dog house. It corresponds well with WunderKeys Piano for Preschoolers Book 1, Lesson 3 (and beyond). To have a blast matching sounds to symbols, click on the image below to download today’s printable. And while you’re here, don’t forget to check out our WunderKeys Method Books on Amazon. Our preschool series is carefully designed to build the skills your youngest students need to have a successful future at the piano (with low-to-no prep on your part! ).